Semi Permanent make up is also known as permanent make up since the implanted pigment which is placed in the upper layers of the dermis cannot be washed away. It is becoming by far one of the most popular treatment in the beauty industry and is not only available to the rich and famous as previously renowned but is now available to everybody and that is mainly thanks to television programmes such as “10 years younger” Colours do tend to fade over time based on your age, skin condition and exposure to UV rays so clients are advised to have a Top up/Colourboost between 12 and 18 months after original application. Using the newest form of Digital technology you can achieve a natural cosmetic enhancement ranging from: Eyelash enhancement, giving the appearance of larger looking eyes with the thicker lashes. Eyeliner: A thin line or thicker for a more dramatic look depending on your preference. Lip liner or lip blush: to reshape uneven lips giving you younger looking lips. 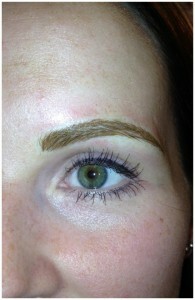 Eyebrow shape/Enhancement: giving you perfectly shaped eyebrows, and smoothing the brow. 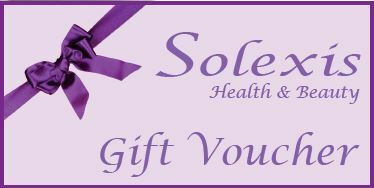 CONSULTATION – Before committing to a treatment, book in with Vanessa, for a FREE no obligation consultation. This relaxed and informal chat is designed to put you at ease and is your opportunity to discuss your desires and to feel confident that semi permanent make up will benefit you. 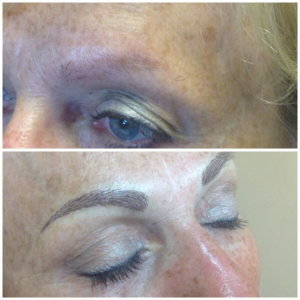 Semi Permanent makeup Menu 20% off – with Affordable Pay Plan. EXCITING NEWS: A payment plan is now available for Permanent Make Up, making it more affordable to have those sought after ‘celebrity brows’. Leave your contact details below and we will get back to you as soon as possible to answer any questions you may have.